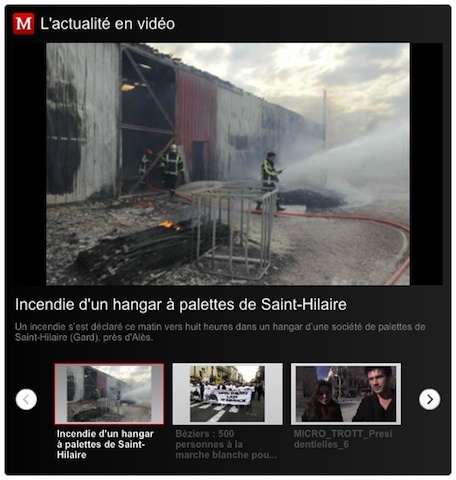 Today we announced that Groupe Sud Ouest, a French publisher of multiple daily press and online media titles, is using Video Cloud to support online video content across its entire range of properties. Averaging a combined total of 550,000 daily visits, Group Sud Ouest serves France’s South-West, Languedoc-Roussillon and Midi-Pyrénées regions with publications such as SudOuest.fr, MidiLibre.fr, CharenteLibre.fr, LIndependant.fr and LaRépubliquedesPyrenees.fr. Groupe Sud Ouest started using Video Cloud last November to provide audiences with an enriched news experience with online video. While its initial emphasis is on training journalists and production values, the publisher is building to a point where it can offer advertisers a broad range of solutions, including hardcopy and web-based ads, as well as premium space in the videos themselves. One of the most significant challenges Video Cloud solves for Groupe Sud Ouest is the ability to support each of its titles across 73 local offices. Because each publication has its own dedicated library within Video Cloud, content can be added from any source, including journalists reporting from the field. Groupe Sud Ouest also sees Video Cloud as a first step toward introducing video for mobile applications, an evolution that is easily achievable using App Cloud, Brightcove’s content app platform. Groupe Sud Ouest is the latest in a growing number of leading French organizations using Brightcove, including Prisma Presse, L'Express, Le Figaro Group, Audi France, Société Générale, and Roche.